The space shuttle Discovery and its seven member crew lifted off at 10:39 a.m. today, successfully returning NASA to flight after a two-and-a-half-year hiatus. The launch follows a 13-day delay after a faulty fuel sensor halted the first launch attempt during countdown. Space shuttle Discovery launches from Kenedy Space Center, Fla. Image courtesy of NASA/KSC. Since the scrapped launch July 13 of STS-114, as the mission is called, engineers worked around the clock to prepare Discovery for one of the few remaining launch windows that extended until the end of this month. NASA selected launch windows based on an approximate 5-minute interval around the "in-plane time," defined as the time when the plane of the International Space Station (ISS) orbits directly over the launch pad at Kenedy Space Center. Also considered are daylight hours and weather conditions, which cooperated for Discovery today. 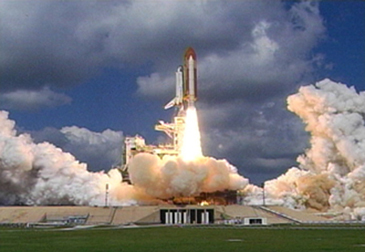 Today's launch is the first shuttle mission since the Feb. 1, 2003, Columbia disaster. In that time, Discovery has undergone renovations to improve safety conditions during launch, orbit and reentry. While docked at the ISS, the crew of mission STS-114 will have 13 days to test improvements to the shuttle, which was first launched 21 years ago. "As the families of Apollo 1 and Challenger before us, we grieve deeply but know the exploration of space must go on," Columbia families wrote in a statement about NASA's Return to Flight mission. "We hope we have learned, and will continue to learn, from each of these accidents, so that we will be as safe as we can be in this high risk endeavor." Specific improvements include a redesigned external fuel tank  the "backbone" of the shuttle that is jettisoned after its propellants are exhausted. It was the insulating foam on this tank that fell off and damaged Columbia. But officials say that changes in how the thermal protection is applied, in addition to new and redesigned hardware, have been central in return to flight preparations. "This will be the safest, most reliable tank NASA has ever produced," said Sandy Coleman, manager of the External Tank Project, in a Dec. 31, 2004, NASA press release. A second modification, called the Wing Leading Edge Impact Detection System, consists of 66 impact sensors and 22 temperature sensors on each of Discovery's wings. NASA aerospace technicians designed the new system to send temperature and impact data to the crew and then back to Earth to be monitored for problems. A third change, a camera and laser attached to Discovery's existing robotic arm, will also allow the crew to remotely check for external damage such as a cracked or missing tile. Two crew members, Steve Robinson and Soichi Noguchi, have trained extensively for three spacewalks during the return to flight mission. The purpose of the first venture outside is for practice repairing the shuttle's protective tiles. Next, they are scheduled to replace a failed gyroscope needed to keep the ISS positioned correctly, followed by the installation of a shelf to hold spare parts while working on the station. 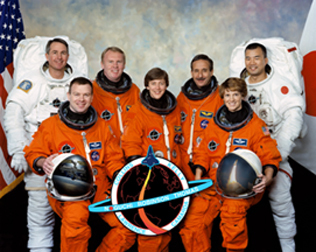 The STS-114 crew includes (from left) astronauts Steve Robinson, Jim Kelly, Andy Thomas, Wendy Lawrence, Charlie Camarda, Eileen Collins and Soichi Noguchi. Image courtesy of NASA. Completing the ISS will be the focus of subsequent shuttle missions. In preparation for such work, Discovery mission STS-114 will deliver a module to the ISS that also contains equipment, food, water and research supplies. "Mission STS-114 signifies the beginning of a new era in human exploration," according to a NASA mission and crew briefing issued on July 6. "Safely returning space shuttles to flight to complete the International Space Station are the first steps in the Vision for Space Exploration." NASA's "vision" includes retiring the space shuttle in exchange for a new vehicle, and a return to the moon as soon as 2015. In the long term, the agency plans to use the moon as a stepping stone to "Mars and beyond," as part of President Bush's call to arms last year (see Geotimes Web Extra, June 17, 2004). In the meantime, NASA scheduled for 2008 the launch of a laser device called "LOLA" that will create detailed maps of the moon's surface and facilitate a return to Earth's closest neighbor. "Astronauts will be able to use it like a USGS [U.S. Geological Survey] hiking map," NASA officials said. "The past two years have challenged all of us to look closely at the work we do and ask 'How can I do this better?'" said STS-114 commander Eileen Collins in a March 22 message to the NASA family. "I believe we are all stronger for having met these challenges, and that collective strength is allowing us to return to flight safely, complete the International Space Station, and move forward with the Vision for Space Exploration."